The Sopris Café is conveniently located between the soaking pools and the family pool area. 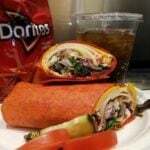 Our menu includes a delicious assortment of snacks, salads, wraps, flat bread pizza, smoothies, ice cream, soft drinks, beer, wine and pre-mixed cocktails. Please note: We ask everyone for identification to purchase adult beverages, please remember to bring your ID with you from the locker room. Choose from a Tomato Basil or Spinach Tortilla. cucumbers, Roma tomatoes and ranch dressing. Kalamata olives with vinaigrette dressing. pecans with balsamic vinaigrette dressing.